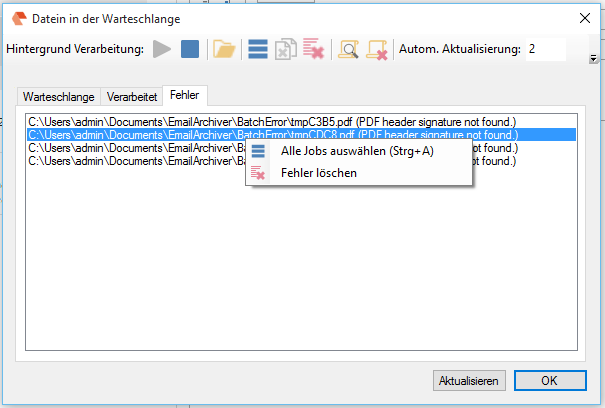 Integration – MSG Export – With the function for archiving together with the Commandline integration for further processing, only the PDF file generated from the message was previously made available in the “Download folder”. Now the MSG with the same name is also exported in the same folder. Thus, downstream programs that are called by commandline also have access to the MSG file. Integration – Commandline % Variables – Error correction – these are now used correctly. Background processing – suppress confirmation message – If jobs are inserted into the background processing queue, the user will receive a message that he must confirm. This display can now be deactivated via a checkbox whereby the complete processing and archiving is done silently. For tests the hosted FileConverter Pro Testserver can be used – this is already pre-set in the EMail Archiver after installation. 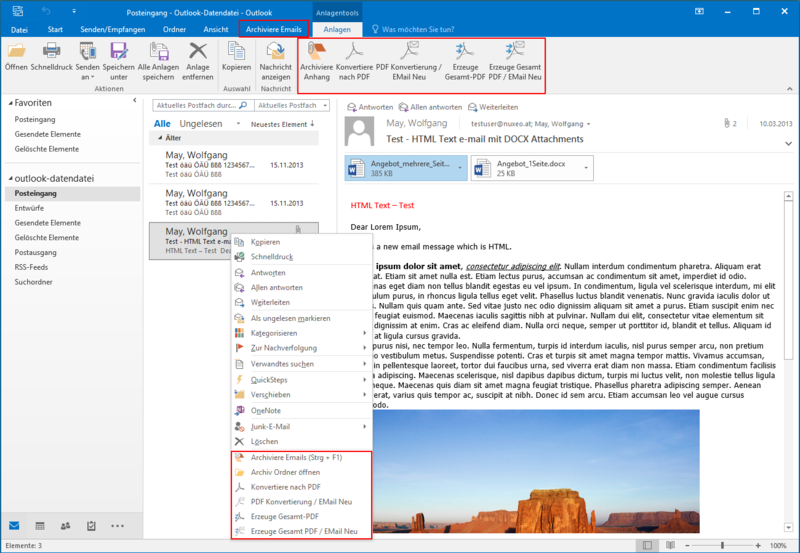 the version of MS Office 2007-32 and 64 bit is not supported by the Email Archiver because the user interface of the 2007 version is different in general and not based on the Ribbon menu. 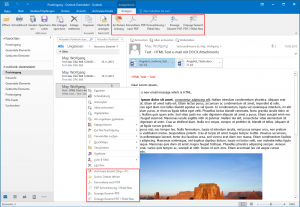 When you archive the messages, in addition to the MSG / EML / PDF file, can also be stored the available metadata of the eMail message. The metadata can be exported as an XML file XLS, CSV or. The records of the messages are output either in an entire file or per message in single files. This metadata variables (PDF information fields, table of contents, stamps, headers and footers and cover =) can also be used in the PDF export settings. 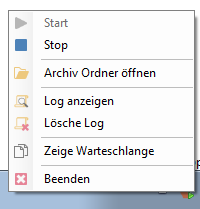 And can also be used for the folder structure, the file name and in the integration of the command line processing. 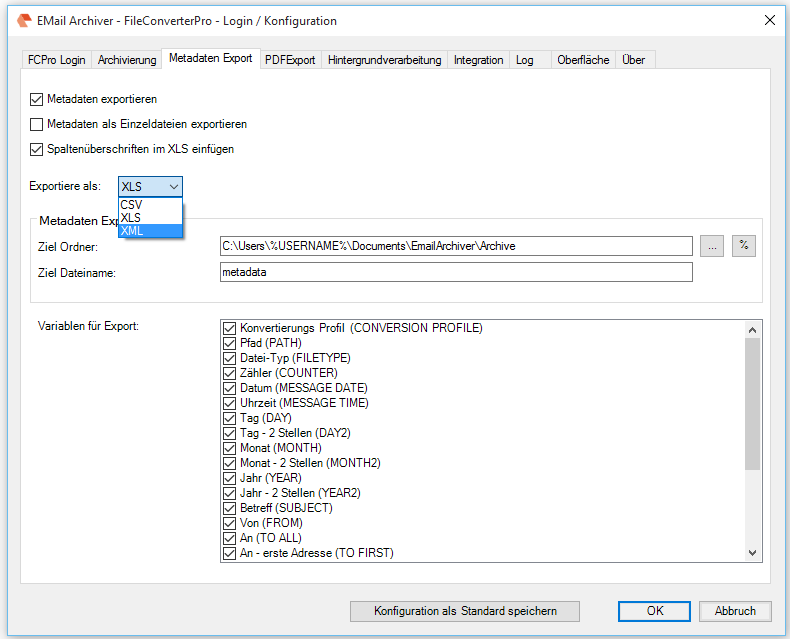 If the configuration file are the default settings – C:ProgramDataEmailArchiverConfigconfigSettings.XML – “read only” sthis is detected and the function / button “Save configuration as the default” is disabled. 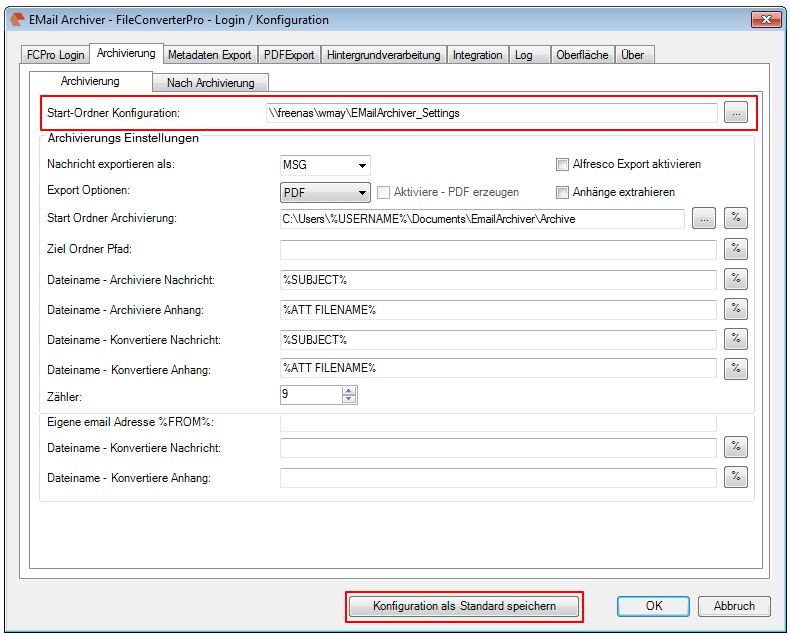 Also is detected if the user configuration file is – C:ProgramDataEmailArchiverConfig<User>configSettings.XML – “read only” – In this case, all the fields and functions of the configuration settings are automatically disabled so that the user can not make changes. 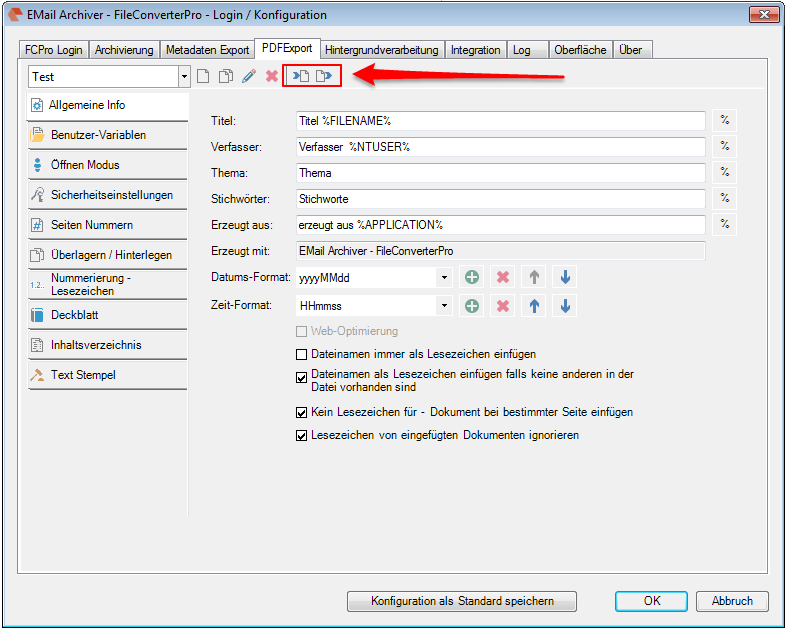 Depending on the configuration of the File Converter Pro, in case of failure either a placeholder page can be generated, or a “real” error is returned to the client. If an error is returned, so this information is now analyzed, displayed and logged. In the background processing there is a separate “Error” tab. There, all errors are listed. Similarly, there is a separate column in the log in which the status “OK” or “Error” is logged. In the log file a counter is incremented for each operation / job and output as the first column. Jobs are also processed in parallel, whereby individual processing steps and therefore log entries are not created in time sequentially. 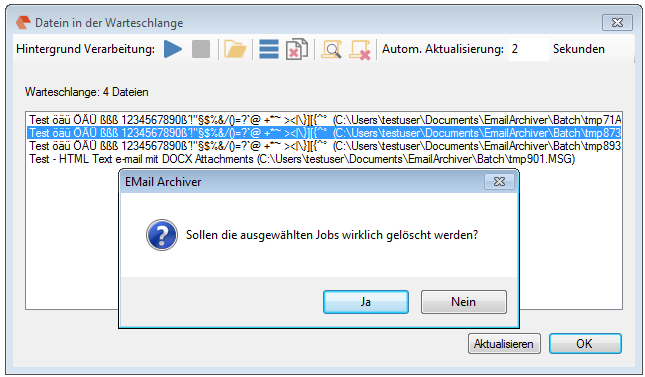 About this ID, it is possible to find all the log entries that belong to a single job. To localize and filter possible errors faster, there is a separate status column in the log. For testing you can use the hosted FileConverter Pro Testserver – this is already set after installing the Email Archiver. To use a customized configuration file during installation, the Email Archiver uses a template XML config file that can be customized and distributed accordingly. When the user starts the application for the first time so this file is taken as a template and used as the User Configuration. By default, this file is configSettings.XML under: C: \ Program Data \ Email Archiver \ Config. This path can be changed on a central network share. 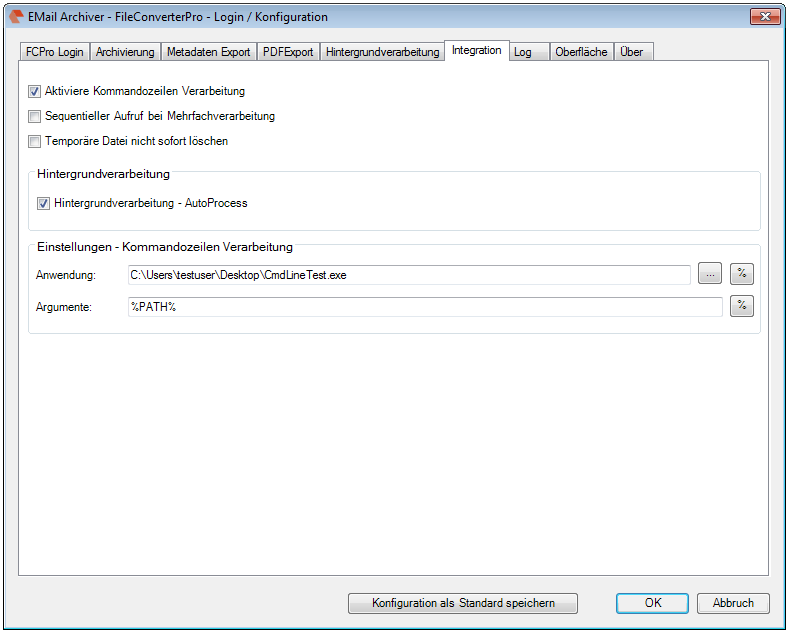 If the current settings are specified as standard on all newly created user, then the function “Save as default configuration” is available. 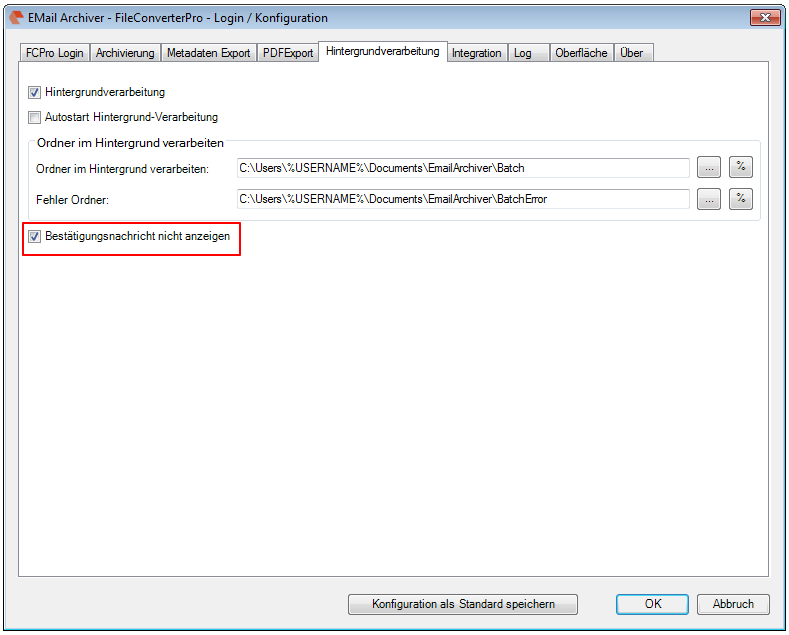 To prevent that configuration settings are changed, there is the entry ReadOnlyConfig in the configSettings.XML file. If this is set to YES, then the configuration via the user interface cannot be changed. 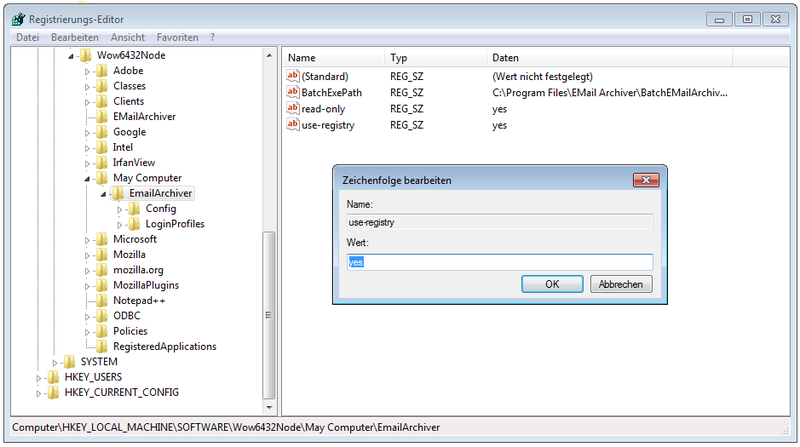 In the configuration settings of the email archive from version 4.0.7 there is the possibility to specify the startup folder for the configuration settings individually. So the standard and individual user settings can also be stored centrally on a network share. 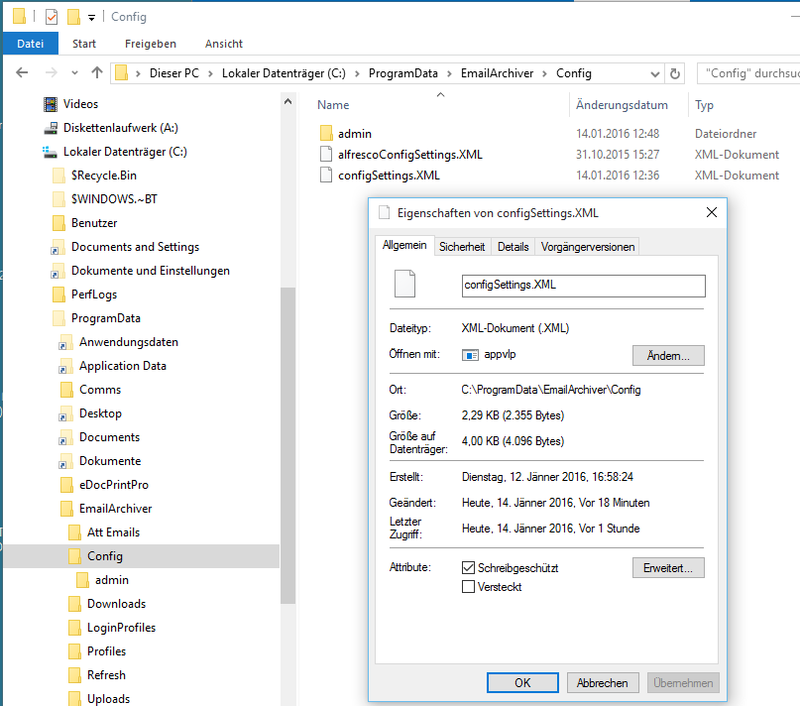 If the path is changed, then all existing configuration files, the login profiles and the profiles PDFExport, copied into the newly selected folder. The setup of this path can be preset and transferred. 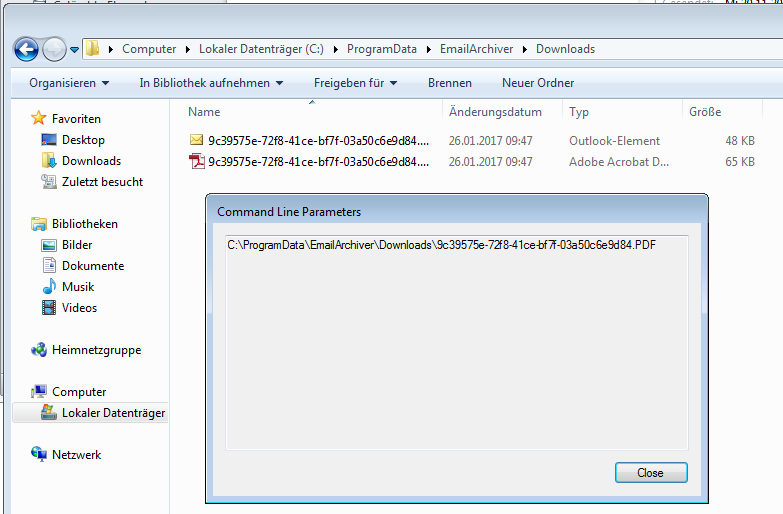 For the Email Archiver Setup are available the Command Line Parameters “RootFolder =” and “/ quiet”. 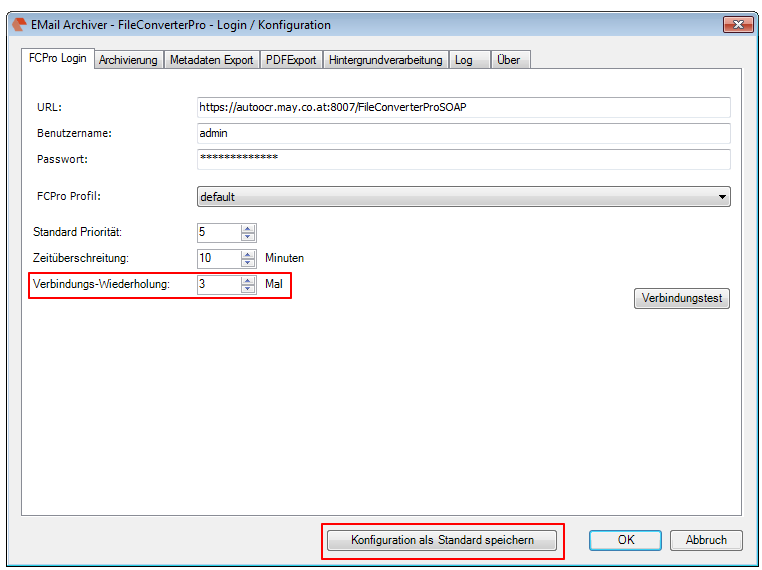 “RootFolder =” specifies the startup folder of configuration settings and “/ quiet” enables “silent” installation without dialogues. For testing you can use our FileConverter Pro Testserver . 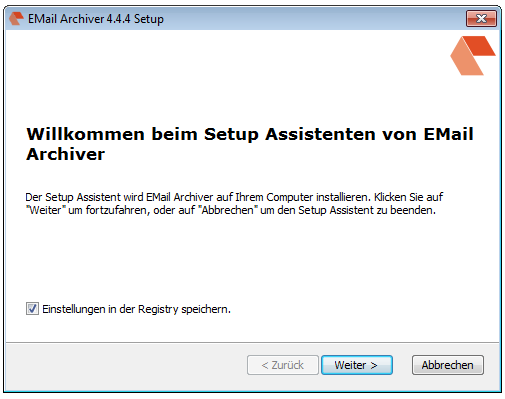 This is already set after installing the Email Archiver. 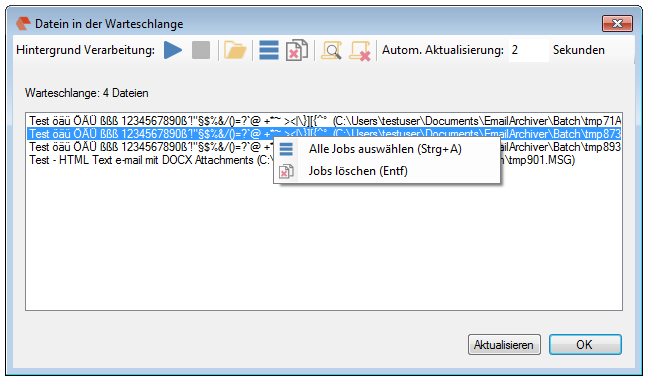 Extension of the background processing – jobs can be deleted from the queue. At “Stop” of the processing active conversions can be aborted or finished. 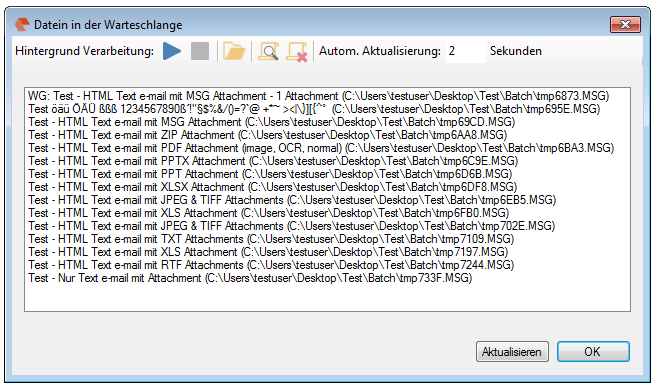 post-processing-steps – mark email, move email to another folder, delete email – now also are done with the background processing automatically and logged – before the function “Update” had to be executed. For testing purposes the FileConverter Pro Testserver, hosted by us, can be used – it is set by default after installation of the EMail Archiver.